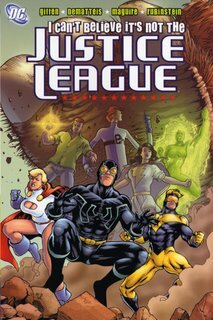 If you're searching for something to tide you over until the 52 trade paperbacks in 2007, don't look to the latest Johns or Rucka blockbuster -- you want Keith Giffen's latest throwbacks to yesteryear, Formerly Known as the Justice League and I Can't Believe It's Not the Justice League. I couldn't have been more excited than when I heard that Keith Giffen would be handling layouts for 52, such that all the disparate artists would all come together with one distinct style. I mean, I'm sure that J.M. DeMatteis and Kevin Maguire play a role in the overall look of Justice League, too, but I tell you what, there's a two-page spread in I Can't Believe with twenty -- count 'em, twenty -- panels, and stuff happens! When the minds behind 52 claim that the story is as compressed as they come, and then I see the sheer amount of dialogue and plotting that went in to these two Justice League trades, let me tell you: I have faith. 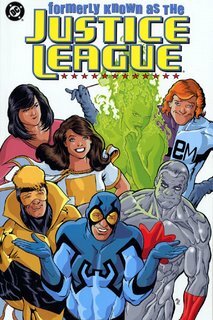 Formerly Known As is a picaresque tale of Max Lord recruiting members of the old Justice League (Blue Beetle, Booster Gold, Fire, Captain Atom, L-Ron, Elongated Man and Sue Dibny, and ultimately, Mary Marvel) as a team of essentially heroes for hire, based in a strip mall. After defeating a small band of Harvard-educated hoodlums that try to run the "Super-Buddies" out of the neighborhood, the team is captured by JSA-enemy Roulette and forced to compete in gladiator games; Mary Marvel nearly kills Captain Atom before Fire stops her. No sooner does the team return home than their old foe Manga Khan arrives on Earth to bargain for L-Ron; the team repels him with help from the "Big 7" JLA, and G'nort returns in the process. Shortly after, in I Can't Believe, the villain Blackguard opens a bar nextdoor to the Super-Buddies, with Guy Gardner. Max sends Blue Beetle to recruit Power Girl to replace Captain Atom, and while at the JSA headquarters, Booster Gold accidentally consigns the team to Hell. Guy and Power Girl mount a rescue mission; Fire tries to resurrect her teammate Ice, but ultimately fails. The team believes they've returned home, but an attack by a Mary Marvel-doppelganger suggests that everything is not what it seems. Both of these trades are joyfully long reads. Frankly, you'd probably have to read JLA: Pain of the Gods about six times to equal the length, content-wise, of each of these trades. But I imagine it's not for everybody. Most of the dialogue here is essentially knock-knock jokes and word play, but there's something incredibly charming about it -- I've only read a little of the Giffen team's original run on Justice League, but I imagine it was much the same. The dialogue isn't just humerous, it's clever and snappy -- perhaps moreso than the '80s League. These trades are not, thankfully, fluffy reads -- as opposed to Lex Luthor: Man of Steel, which also had a lot of material in it, except that Lex Luthor was almost entirely a-continuity, and Justice League actually ties in more than I expected. Though at times the current policy at DC seems to be "keep what you like, ignore what you don't," the Justice League trades seem to try hard to continue what's been established. In the current volume, Beetle's heart condition from Birds of Prey is front and center, and here, at least, Maxwell Lord is still a cyborg (that L-Ron has shed his Despero body for his robotic body remains unexplained but really, what difference does it make?). The jokes in the first volume, however, are mostly in the characters making fun of one another; it's not until the second volume that things begin to get a bit, well, political, let's say. Giffen's gone on record saying he bears no animosity toward DC for essentially decimating the members of the '80s Justice League, and I wholeheartedly believe him ... but that doesn't mean the creative team won't take a few pot shots. A running gag of I Can't Believe is the notion that Sue Dibny is secretly pregnant -- back in the '80s, this would have been a perfectly average Justice League joke, but current readers can certainly recognize this as a considerably dark-tinged nudge. So too, the closing shot of the story is of Blue Beetle and Max Lord laughing together; there's a brilliance here on the part of the writers, in that the reader isn't quite sure if they're supposed to interpret this as the last gasp of better times, or the first hints of something worse. What impressed me most, however, was the plot involving Guy Gardner, Fire, and Ice in the second trade. Though the late Guy Gardner: Warrior relationship between Guy and Fire is not mentioned here, we do see Giffen and company picking up some of the characterization of Guy as more mature, as written by Beau Smith. I've always thought that Smith did an excellent job, writing a Guy who was tough and opinionated, but not a one-note idiot. Giffen and company continue that here, exploring both Guy and Fire's unwaivering love for Ice. When the two try to lead Ice out of hell, doomed to failure, it's one of the most gripping scenes -- in a so-called "funny" comic -- that I've read in a while. And the full-page spread that ends the issue (chapter 4, I believe), is remarkably, remarkably emotional. Just as the characters emerge at the end of I Can't Believe It's Not the Justice League with an inkling that they all might be a lot more mature than they originally thought, we're left to understand at the end of the trade that amidst all the knock-knock jokes, we perhaps came to know these characters far better through their jokes than we have some other characters through more traditional super-hero fare. Without further ado, my plan is to head right to The OMAC Project now, for more Blue Beetle/Max Lord fare, though with an albeit different tone. Join me, won't you? i loved these stories, they have both great art and storylines. 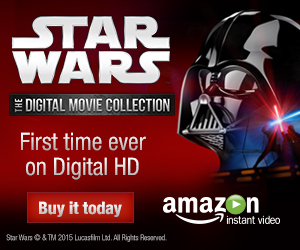 too bad current DCU is going in a different,'darker' direction. I was in on the full run of the more humorous Justice League when it came out, and these two trades made me long for those days.